Pizza Pasta Bake | sweet ravioli! I found this recipe on Pinterest. It looked irrestible, with its capsicum, pepperoni and cheese. My kids weren’t overly impressed by it, seeing as the only thing they like on their pizza is ham and pineapple! But I imagine them loving it when they are older. My recipe differs from the original in that I like to cook down my veggies rather than adding them to the pasta raw. I tried that the first time and found the capsicum was too crunchy. Note that the dried herbs can be substituted for an Italian herb mix. Preheat the oven to 190 degrees Celsius. Bring a large pot of salted water to the boil. Cook pasta 2 minutes less than packet directions and drain well. Set aside. While the pasta is being prepared, bring a large sauté pan up to medium heat and add a few tablespoons of olive oil. When hot, add the capsicums and onions and cook for 3-4 minutes. Add the mushrooms and cook a further 2 minutes. Remove from heat. Prepare a large rectangular baking dish with the remainder of the oil, the dried herbs and chilli, and salt and pepper. 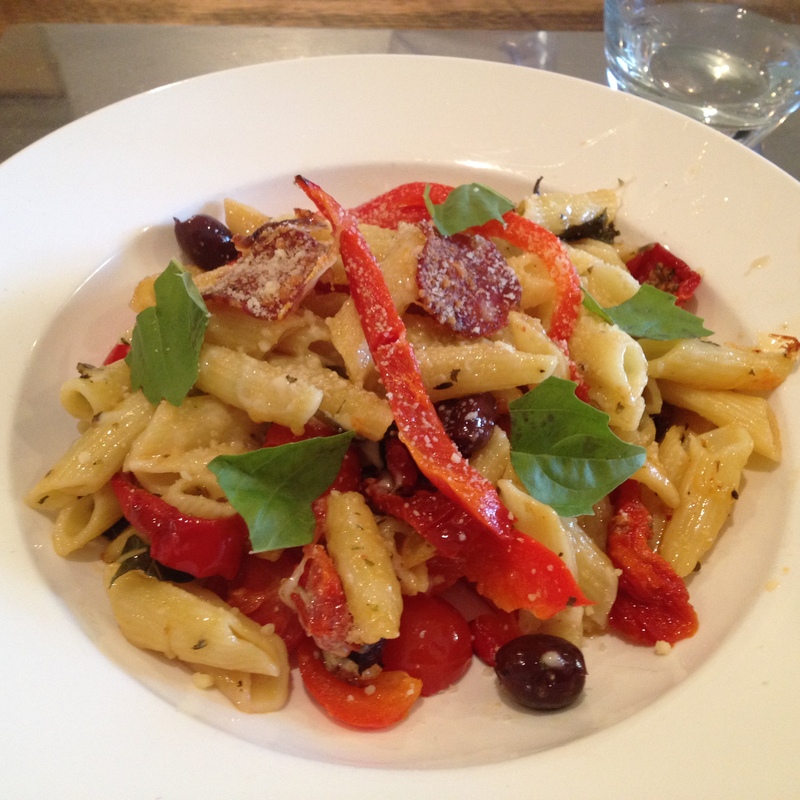 Throw in the pasta, your cooked vegetables, along with the olives, semi-dried tomatoes and ¾ of the mozzarella. Toss well. Arrange the pepperoni slices evenly over the top and then sprinkle the remaining mozzarella and the parmesan. Drizzle with some of the oil from the semi-dried tomatoes. Cover with foil and bake in the oven for 30 minutes. Remove foil and let the top get crusty for a further 10-15 minutes. 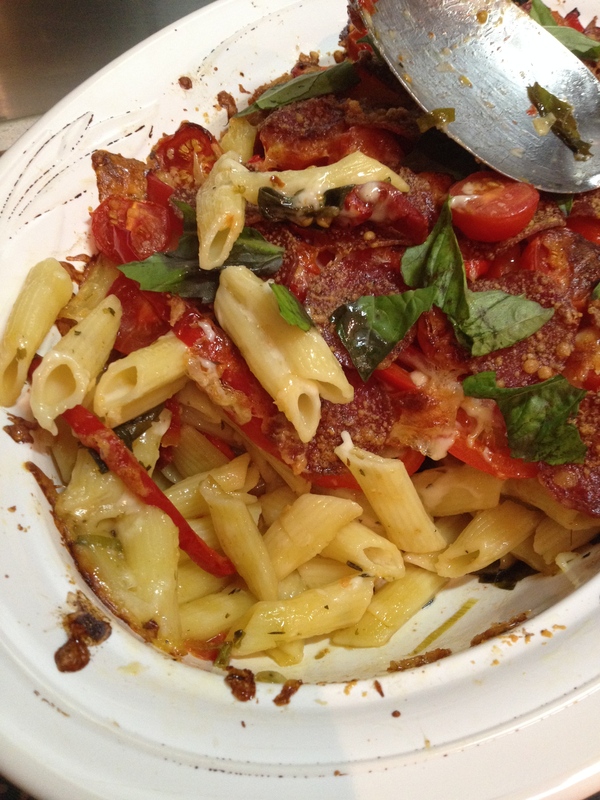 Serve with scattered basil leaves.